Lung transplantation provides a realistic hope of improved survival and enhanced quality of life. However, outcomes can be disappointing, meaning many decisions are highly controversial. Practice is largely based on expert opinion and there is a dearth of high-level evidence. Not surprisingly, this leads to centre-specific practices that may vary considerably in controversial areas. The aim of this review, therefore, is to explore some of those domains and present the available evidence. As the science of lung transplantation approaches its fifth decade, we are only now reaching a critical mass of clinicians and scientific researchers to enable adequately powered studies to assist in informing our approach to some of these controversies. Lung transplantation remains an art, combining experience with evidence. Clinicians need evidence to guide them on a myriad of questions, from candidate selection and listing, to organ donor acceptance, immunosuppression and chronic allograft dysfunction. Chronic lung allograft dysfunction pathogenesis deserves further detailed study. To illustrate the spectrum of controversial areas in lung transplantation including whom to list, which organs can be used and for whom, immune suppression and infection prophylaxis, and causes and phenotypes of chronic lung allograft dysfunction. To inspire clinicians to always ask questions and help collect the evidence we need to inform decision making. One overriding achievement of the International Society for Heart and Lung Transplantation (ISHLT) since its inception over 30 years ago has been a commitment to promoting safe practice leading to the development of a number of consensus position papers. Despite this, when confronted with real-life situations in lung transplantation (LTX), we may find that two clinicians, both with great experience and wisdom, hold very different and equally strong views. Prof. Archie Cochrane, the founder of evidence-based medicine, experienced a similar problem when questioning experienced breast surgeons in Canada in the 1970s regarding the best operation for a breast lump. For an experienced clinician (or indeed, any practitioner), the answer “we don't know” is often the most difficult one to give. We are going to take the reader on a quick tour of some areas where perhaps that would, in truth, be the most accurate response. The fundamental questions remain the same: “what is the evidence?”, “what are the risks?” and given competing risks and priorities, “what should we do?”. Often, there is no right answer and the controversies we face may challenge both our philosophy and integrity. The first question every transplant physician and programme must answer is “whom should we list?”. Absolute contraindications to LTX have been well accepted by programmes for many years, including recent malignancy, untreatable organ dysfunction, untreatable coronary artery disease, acute medical instability, infection with highly virulent or resistant organisms, active tuberculosis, chest wall deformity causing restriction, inadequate social support, ongoing addiction or severely limited functional status with limited rehabilitation potential . However, this list hides a myriad of grey areas: what about a melanoma completely excised 3 years ago? Or a small, minimally invasive squamous cell cancer, resected with clear margins 1 month ago? For many potential contraindications, the evidence upon which the clinician must rely is severely limited. Case series are often small and underpowered to guide practice or only published in abstract format, while large international registries, such as the United Network for Organ Sharing (UNOS), rarely have the sensitivity to capture the minutiae necessary to answer these issues. One of the topics that most often causes great anxiety is denying a patient listing because of resistant organisms (which is most frequently an issue for patients with bronchiectasis and cystic fibrosis). For example, Burkholderia cenocepacia has long been considered an absolute contraindication to LTX, and still is in most centres. However, some centres will consider listing a patient who has been culture negative for a period of time, following treatment [2, 3]. Similarly, Lomentospora prolificans (formerly Scedosporium) is often considered an absolute contraindication to transplant as it is very resistant to available antifungal therapies. We can only find one published case of transplant following a positive culture with Lomentospora and the patient died within months of transplant from disseminated disease . Despite this, a number of centres have privately reported to us that they have successfully transplanted patients who have cultured Lomentospora. Unfortunately, these are not published. Hence, in many instances, decisions still have to be made based on little more than experience and the individual clinician's perspective. Often, we do not know the correct answer. A 21-year-old male with cystic fibrosis is listed for LTX, with forced expiratory volume in 1 s (FEV1) 26% predicted after suffering three pneumothoraces requiring chest drains. He has grown Aspergillus previously and is on itraconazole. Computed tomography (CT) of the chest shows a stable upper-lobe cavity with a thick wall. 6 months after listing, a sputum culture is positive for L. prolificans for the first time. His CT scan is unchanged from 1 year earlier. His listing is put on hold. Despite voriconazole and terbinafine, Lomentospora is cultured for the next 5 months. He loses weight, has fever and is tachypnoeic at rest. After much discussion, the lung transplant team informs his family that he can no longer be considered a transplant candidate. He returns to the care of his referral hospital for palliation. While multiresistant organisms may present an absolute contraindication in some centres, they will present a relative contraindication in others. This introduces the second major controversy facing the lung transplant physician: high-risk patients who have multiple relative risk factors for a poor outcome but no absolute contraindication. Transplanting deserving individuals who have a high perioperative mortality is controversial. Lungs are a scarce resource and might be better used for more robust candidates. Indeed, the ISHLT consensus statement for candidate selection  states that, to be considered, individuals should have a “high (>80%) likelihood of surviving at least 90 days after lung transplantation”. Such a policy would rule out many marginal candidates. One attempt to deal with this issue has been the development of The Lung Allocation Score (LAS), adopted by the USA and Germany . Using this system, high-risk patients can be listed; however, the organ allocation score eventually decides who will be transplanted. Under the LAS, organs are preferentially referred to patients with the highest predicted improvement in survival in the first year after transplant. The LAS has two main limitations. First, predicting exactly who will die and who will survive remains difficult. Risk scores, such as used by the LAS, have poor sensitivity and specificity to make this judgement for any one individual. They usually depend on data from international registries such as UNOS, which include many factors such as the reason for transplant, oxygen dependence, steroid use, and renal and liver function among other issues. However, they often lack sensitivity to details such as frailty, psychosocial support, resistant infections, and past medical history including infections and immunosuppression. The second problem with the LAS is that it does not maximise quality of life after transplantation. Indeed, for some patients, such as those with emphysema, quality of life may be the main indication for transplant, at least in the opinion of the patient. Indeed, these patients will often live longer with a transplant than a frail candidate. Lungs are a limited resource and maximising quality of life may be a better goal from a utilitarian perspective than maximising net survival in the first year. Patients with interstitial lung disease (ILD) are particularly impacted by allocation decisions. ILD is a risk for poor survival after transplant. Furthermore, patients with ILD often have multiple other independent relative risk factors for early mortality such as age, oxygen dependence, corticosteroid use, pulmonary hypertension, coronary disease or renal impairment . In fact, due to poor outcomes, many centres worldwide have traditionally avoided transplanting patients with complex restrictive lung diseases such as scleroderma or connective tissue diseases, although recent evidence suggests that, for selected patients, outcomes are similar to patients transplanted for idiopathic pulmonary fibrosis [7–9]. Following implementation of the LAS, ILD is now the most common indication for transplant in the USA, accounting for ∼40% of cases . The impact of this decision cannot be underestimated for individuals and for transplant centres. For the individual transplant centre, the decision on whom to transplant can have profound impacts on their overall post-transplant survival. For better or worse, their unadjusted outcomes (unadjusted for the risk of the patients they are transplanting) are usually the main way centres and governments promote the quality of LTX service they provide. The net effect of the LAS is that many centres in the USA are transplanting much more challenging and high-risk cases than previously , and possibly than other parts of the world. Outcome data analysis from the LAS are immature, but eagerly awaited. A 61-year-old male with rapidly progressive extrinsic allergic alveolitis is referred to our unit following a recent hospitalisation. He is now on 6 L oxygen continuously and can only walk 5–10 m. He is on 10–20 mg of prednisolone daily. He is dependent on his carers for his activities of daily living. He is intelligent and has a dedicated family. He faces profound dyspnoea without transplant and an average life expectancy of 255 days (using the LAS calculator). If he receives a transplant, this improves, though only to 312 days. That is, even with a transplant, his 1-year survival is only 40%. Despite the risks, he is listed and receives his transplant emergently. He is extubated on day 2, but remains delirious and BiPAP dependent. Staphylococcus aureus is cultured on bronchoscopy. Despite treatment, he develops worsening pneumonia and irreversible respiratory failure. He is palliated after 10 days. Can we use these organs? Using donors outside these ideal parameters can often lead to controversy, particularly if the transplant goes badly. In clinical practice, most potential donors have at least one relative contraindication to lung donation, such as a distant history of smoking or resected cancer, an infiltrate on chest radiography, or a sputum sample showing neutrophilia or a positive culture. There are many examples where donations outside these ideal parameters (so-called extended criteria donors) are now routinely performed, such as donation after (controlled) circulatory death donation . Similarly, successful use has been made of older donors [12, 13], and donors with lower PaO2 , positive cultures [13–15] or pulmonary emboli . This means the question on the night of transplant usually becomes how many relative contraindications is a physician or surgeon willing to accept before deciding that a potential donor is unsuitable. Ideally, these decisions would be dictated by solid evidence and actuarial risk assessment scores. Scores exist for listing, such as the LAS. However, for donation, no such scores exist. The use of extended criteria donors remains an art, highly dependent on the clinician's judgement. A 63-year-old female is referred as a potential donor after suffering an intracerebral haemorrhage. She has a 25-pack-year smoking history and quit 10 years ago. She also had a 3-mm melanoma completely excised from her forearm 3 years ago. She is breathing spontaneously on a PEEP of 5 cmH2O and pressure support of 10 cmH2O. She has acceptable gas exchange with a PaO2 of 353 mmHg on 100% oxygen despite patchy changes at the right base on chest radiography and purulent sputum which is growing Haemophilus influenzae. Donation is accepted and the donor dies 45 min after cessation of cardiopulmonary support. The recipient is a 57-year-old female with severe pulmonary fibrosis, who is alive and well 6 years later. Ex vivo lung perfusion (EVLP) may help change this. Trials of EVLP have, thus far, demonstrated that outcomes using extended criteria lungs with EVLP are equivalent to ideal lungs [16, 17]. However, it remains unclear if this may be because of the efficacy of EVLP or because extended criteria lungs can usually be used safely without EVLP at all . Randomised trials to answer these questions are continuing . Although we are waiting for evidence, proponents of EVLP technology hope that it will revolutionise organ retrieval in a number of ways, including the following. These are all being intensively researched and may revolutionise the field of donor retrieval. In the extreme case, it may mean that in future EVLP becomes standard of care for all potential donor organs allowing many more organs to be retrieved and optimised organs to be used. Cost is an issue with conservative estimates of USD 35 000–70 000 per case. Who should receive these organs? Once the decision is made to accept a donor organ, the next question becomes, for whom? This is no less controversial. It involves weighing urgency, as well as the best match for the donor, which may include matching to age, size and immunology. As yet, there are again no agreed algorithms to achieve this. Optimal sizing is probably more important in LTX than any other solid organ transplant due to the intimate mechanical relationship between the lung and the chest wall. The natural inclination is to try and find a donor with approximately the same size as the recipient. However, in many cases, a 1:1 “size match” between donor and recipient is not ideal at all. Hyperexpansion of the thoracic cavity in obstructive disease may lead clinicians to purposely oversize these transplants. Similarly, restrictive disease may lead the clinician to undersize the organ, closer to match the current total lung capacity (TLC) and the current chest wall, although this may be a substantial reduction from the predicted TLC. For example, a common approach for a recipient with an actual lung volume of 3 L (50% of the predicted volume of 6 L) is to use a donor with a total lung volume around 4.5 L, or half way between the actual and predicted TLC [20, 21]. This decision may have very important consequences. Cohort studies have suggested that oversizing an allograft by 30% of the predicted TLC may reduce post-operative mortality by up to 50%, compared to lungs undersized to predicted TLC by 30% . However, it is possible that cohort studies are just a reflection of the biased selection practices we already use to transplant patients with severe restrictive disease. For example, patients with more severe restrictive disease are more likely to have smaller actual lung volumes and be frail. Frailty and severity of restrictive disease may be poorly captured in current international databases, skewing results from multivariate analysis. There are no randomised trials into sizing of lungs. Single lung transplant (SLTX) or “cut-down” LTX are both approaches that are sometimes used to transplant patients with restrictive disease. Like sizing, these remain controversial. For SLTX, some studies have suggested an association with reduced survival after transplant . However, these studies may be biased and unable to account for all the factors at play, in a similar way to studies of sizing. Indeed, in perhaps the best retrospective cohort study to date, there was no difference in survival . This is an extremely important issue. If SLTX and bilateral LTX really do have similar survival, using SLTX has the potential to decrease waiting time to transplant, increase the numbers of transplants and hopefully reduce death on the waiting list . Just as a good size match might influence the choice or recipient, so might a good immunological match. This is, perhaps, one of the most complex and least understood areas in transplantation. Pre-formed human leukocyte antigen (HLA) donor-specific antibodies (DSAs) measured by single antigen bead Luminex platforms are now the usual gold standard. However, in practice, the sensitivity and specificity of Luminex to predict LTX outcome is unknown. There is extensive debate about how to improve the accuracy. For lack of better alternatives, many physicians also use the mean fluorescence intensity (MFI) as a secondary measure. There is some evidence of a weak association between MFI and outcomes; however, it has a number of limitations . In theory, HLA eplet matching (eplets are the small binding sites of HLA antibodies to HLA antigens) may improve on the Luminex by more precisely matching antibodies likely to affect the donor organ. Algorithms that use eplet matching to identify high-risk mismatches are being developed but remain unproven . To improve decision making, some centres are able to run in vivo T- and B-cell cross-matches between donor and recipient. However, the sensitivity and specificity of cross-matches is also less than ideal . B-cell matches are particularly contentious and many centres do not perform them at all. Given the limited evidence, when urgent transplants are required, or better cross-matches are unlikely, some centres choose to transplant to recipients with pre-formed DSA. In one case–control series, patients with pre-formed DSA were treated with plasmapheresis, intravenous immunoglobulin (IVIG) replacement and induction therapies at the time of transplant. These patients had very similar outcomes to patients who did not have circulating DSA at transplant . This may reflect the efficacy of the treatment; however, it may also demonstrate the poor specificity and sensitivity of the Luminex to predict outcomes. A 63-year-old female with idiopathic bronchiectasis has been listed for 2 years. She is oxygen dependent and struggles to walk 10 m at home. She has four or five admissions a year with infective exacerbations. Her transplant has been delayed due to difficulties finding a match. She is diminutive and has a TLC of 3.5 L. Furthermore, after three children, a miscarriage and multiple blood transfusions, she is highly sensitised. Repeated donor offers have tested T- and B-cell positive with high-MFI DQ DSA detected. She eventually receives an offer from a female with predicted TLC of 4.5 L, although she has a low-level B-cell cross match (two of eight) and a DQ3 DSA at an MFI of 2300. The organ is accepted. At transplant, her immunosuppression is augmented with IVIG. Plasmapheresis and antithymocyte globulin (ATG) were not given. She has multiple complications due to her frailty and struggles to rehabilitate; however, at 2 years she is alive and well with reasonable graft function, minimal detectible DQ7 DSA, and no de novo antibodies. By contrast to the listing and selection of donors and recipients, the choice of first-line agents for immunosuppression and prophylaxis in LTX has relatively solid evidence and is less controversial. At the time of transplantation, most centres will use a combination of high-dose methylprednisolone, a calcineurin inhibitor (tacrolimus or cyclosporin) and a cell cycle inhibitor such as mycophenolate or azathioprine. Nevertheless, there is some controversy. At transplant, ∼50% of centres worldwide use an induction agent, typically ATG or basiliximab, a monoclonal interleukin-2 receptor blocker. Both spare high-dose tacrolimus and associated renal dysfunction. However, evidence for these medications remains thin. A retrospective cohort study of >4000 lung transplants in the USA showed that induction with ATG and basiliximab was associated with a minor benefit at 4 years . However, the only randomised trial of the use of ATG conducted internationally in multiple centres demonstrated no significant benefit, despite being well powered . The use of everolimus in LTX has been controversial for some time; however, there now appears to be growing consensus about its role as an adjunctive or alternative immunosuppressant. It is one of the few areas where there is now good evidence for its use thanks to a number of well-conducted randomised trials [32–34]. Personalising this regimen using biomarkers and surveillance investigations remains an unrealised goal. Worldwide surveillance bronchoscopy and transbronchial biopsies are often employed. However, there are no prospective randomised studies regarding their efficacy. Similarly, some centres routinely monitor for the develop of de novo HLA DSA after transplant, hoping this biomarker of immune events can guide therapies . Invasive fungal infections are very common after LTX. However antifungal agents are not benign. Ideally, we would have biomarkers for fungal infections allowing us to personalise prophylaxis. Some centres use cytology and cultures to guide prophylaxis. The role of measuring galactomannan in bronchoalveolar lavage fluid is controversial, though there are proponents who support its use along with cultures to guide therapy . Similarly, approaches to the use of replacement IVIG for hypogammaglobulinaemia have not been tested. LTX patients with iatrogenic hypogammaglobulinaemia are eight-fold more likely to develop opportunistic infections such as cytomegalovirus or invasive fungal infection  and two- to three-fold more likely to develop chronic allograft dysfunction (CLAD) . A 60-year-old-male is transplanted for emphysema. For the first 6 months, he is maintained on tacrolimus, mycophenolate 1500 mg twice daily and prednisone 15 mg daily. Itraconazole prophylaxis is started at 1 month for fungal elements on cytology. At 6 months, he develops Nocardia, concurrent with L. prolificans, Aspergillus fumigatus and respiratory syncytial virus. Nocardia is treated with meropenem and sulfamethoxazole-trimethoprim. Itraconazole is switched to voriconazole and terbinafine to treat Lomentospora. He is found to have profound hypogammaglobulinaemia and started on monthly replacement. He makes a full recovery and remains well on monthly replacement IVIG 1 year later. Unfortunately, despite improvements in peritransplant care in the last 36 years (1-year survival worldwide now averages >90%), average survival after LTX remains just 5–7 years. Beyond 1 year, the majority of deaths are due to CLAD . CLAD has two well-described phenotypes, the bronchiolitis obliterans syndrome (BOS) characterised physiologically by airflow limitation and fibrotic luminal occlusion of the distal bronchioles (with relative preservation of the interstitium) and the more recently recognised restrictive allograft syndrome (RAS) characterised by restrictive changes in lung function, pulmonary opacities and pleural–parenchymal fibrosis, predominantly in the upper lobes . Research into CLAD has used two quite distinct approaches in the last 10 years. The first has focused on treatment. Azithromycin therapy is accepted broadly as a potentially successful therapy in a proportion of patients to reverse airflow limitation and may reduce the development of CLAD . However, other treatments such as extracorporal photopheresis [42–46] and total lymphoid irradiation  remain controversial. Most research for these therapies is based on single-centre case series without a control arm. “Treatment effect” is inferred by examining the rate of change in the FEV1 before and after treatment. However, the difficulty with this approach is that changes may simply reflect the natural history of the disease. 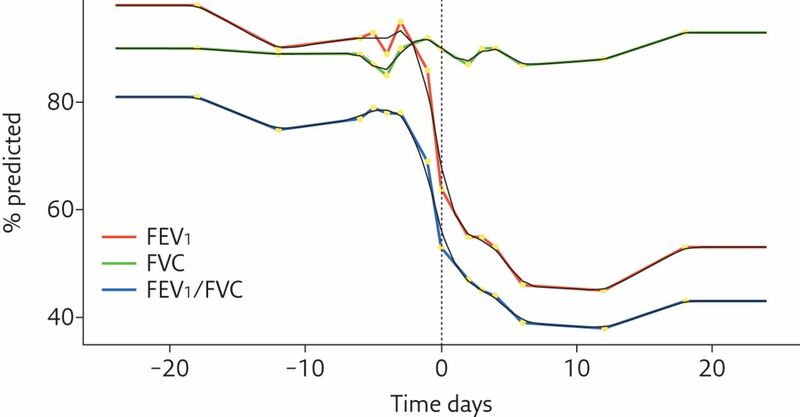 For example, a patient experiencing an exponential decay of FEV1 due to progressive airflow limitation is shown in figure 1. As the disease progresses, the linear rate of airflow limitation will slow. However, an uncontrolled study of treatment efficacy might conclude that the treatment appears to be efficacious. Decline of lung function of a LTX patient who rapidly developed severe BOS at our centre. Adjunctive treatment is initiated at time point 0. The loss of FEV1 slows after treatment. However, it is unclear if this represents the effect of treatment or a natural exponential decline of disease progression. FVC: forced vital capacity. Further confounding conclusions on efficacy is the variable rate at which CLAD tends to progress. Some studies have attempted to phenotype patients as 1) “treatment responders” and 2) “non-responders” by examining the rate of development of end stage CLAD . They often find that treatment responders are those patients with relatively stable lung function before treatment started. It is far from clear that this is actually “responding” to treatment. Instead, this group may just have a different natural history of disease to group 2. A 28-year-old female was transplanted 18 months ago for cystic fibrosis. Unfortunately, she presents 18 months after transplant with low tacrolimus levels, lethargy, a diffuse infiltrate on CT scan and severe acute cellular rejection on biopsy (A3B2). Pulse methylprednisone results in clearing of the infiltrate; however, after treatment, her FEV1 begins to fall rapidly. She loses >30% of her FEV1 in a month. She develops de novo DSA and is diagnosed as having probable antibody-mediated rejection (AMR). She begins plasmapheresis, IVIG and rituximab therapy. Despite clearance of circulating DSA, her allograft dysfunction continues to worsen, resulting in BOS grade 3, with a drop of >50% of her baseline FEV1. Eventually, after a series of viral infections, her FEV1 appears to stabilise. Everolimus is started. 6 months later, she remains alive with an FEV1 still at 0.9 L. Whether treatment contributed to her stability remains unclear. To date, the main alternative approach to research of treatments for CLAD has been endotyping, the study of disease process. Currently, in LTX, we attempt to endotype rejection into two types, acute cellular rejection (ACR) and AMR. Recently, AMR has been a hot topic of conversation, following from the observation that the development of de novo HLA DSA is very strongly associated with the subsequent development of severe CLAD . This has led some centres to advocate treatment of subclinical de novo DSA with antibody-depleting plasmapheresis, immunoglobulin and rituximab. However, this remains highly controversial because a temporal or causal association of de novo DSA to CLAD has not been demonstrated. The best evidence we have for treatment of subclinical de novo DSAs is again from uncontrolled cohort studies where “responders” (who were noted to have elimination of DSA after treatment) were less likely to develop CLAD . However, disappearance of DSA may be a biomarker of a nonsustaining process and have nothing to do with the treatment given. Randomised studies are again required. In fact, taking a step back from treatment of “AMR”, the proof that AMR is occurring in the lung, and the mechanisms by which antibodies may act, remain highly debated. The consensus document on AMR produced by the ISHLT concentrates on defining markers which might clarify the probability that AMR is occurring at all . However, these have not yet been clinically validated. Indeed, we still have poor evidence on the sensitivity and specificity of histopathology and C4d staining on transbronchial biopsy and the presence of circulating DSA as predictors of one distinct process. Multiple processes may be at play. What current CLAD research actually appears to reveal is that clinical presentations and trajectories of CLAD vary considerably. Some patients progress very quickly (over weeks or months) while others only progress very slowly over many years . Furthermore, important markers used by clinicians such as radiology, lung function changes, microbiology or inflammatory markers are not included in the current definitions of ACR or AMR. For example, currently, two patients can both have circulating DSA, falling lung function and a paucity of changes on histopathology. Both have possible AMR by ISHLT criteria. However, one has restrictive physiology and opacities on CT and goes on to develop rapidly progressive RAS, the other has a clear CT and obstructive physiology, develops BOS. This begs the questions, are they in fact suffering different acute processes? Or, is there a missing link? Indeed, in the transplanted lung, sterile inflammation may involve a rich and diverse tapestry of mechanisms, far beyond the classic definitions of ACR and AMR. Diverse roles might play through different cytokines, viral infections, exosomes and components of the native immune system in a complex interplay with the adaptive immune system and HLA DSA . CLAD research appears to be at a similar junction to asthma research in early 2000 when critical phenotyping defined atopic young children, neutrophilic and eosinophilic subtypes with different presentations and outcomes [52, 53]. In CLAD research, we may need more precise definitions of the phenotypes of rejection. In asthma, new research into phenotypes paved the way for new targeted therapies. In LTX, patients and clinicians are still waiting anxiously. Lung transplantation over 36 years has delivered truly remarkable and life-saving therapy to many individuals with intractable respiratory disease. However, the outcomes remain far from optimal for many patients. The questions of whom to transplant, which donors to accept, whom to receive the organs to and how to immunosuppress continue to be paramount. Currently, the evidence to guide these practices is largely derived from individual centre experience, case series and cohort studies, which may be prone to selection bias, even in multivariate analysis. Adequately powered randomised studies to inform the best approach to these issues are needed to improve outcomes. What is the most common type of evidence we rely on in LTX? When listing a patient, multiple factors contribute to fitness. Which of the following is/are likely to be a complete contraindication to transplant? When accepting a potential organ donor, there are often multiple relative risks present. Which of the following is still controversial? In the field of CLAD, which of the following is true? a. Unfortunately, registries (and cohort studies) often lack the sensitivity to help guide decisions on the complexity of clinical care, meaning we still rely on expert consensus statements, usually based on years of unpublished experience as well as case-control and cohort studies. Very few randomised studies have been conducted, but are critically needed. a, b, c and d. LTX centres and clinicians often confront very difficult emotional and clinical questions. Unfortunately, there are many risks factors involved and the answer is often life and death for our patients. The situation makes for controversy until (and even after) better evidence is available. None of the answers is correct. All the examples given are relative contraindications to LTX, meaning that transplant might be undertaken in some circumstances, although the risk of a good outcome will vary on the comorbidities and details of the case as well as how many risk factors are present. Of those listed, the strongest relative risk factors are ECMO and current cultures of B. cenocepacia or L. prolificans. However, patients on ECMO are now frequently transplanted worldwide provided they are otherwise strong and young, and patients with resistant organisms might be transplanted if there is no evidence of invasive disease and/or if the organism responds to treatment. c. Many organs that are “marginal” under previous consensus guidelines may, in reality, be excellent organs. Many centres transplant these organs without EVLP. EVLP may yet prove to be a “game changer” for LTX. However, the best way to use it remains to be proven. c. Patients with possible AMR may not have any evidence of cellular rejection. Some will develop BOS, others develop RAS. It is thus unclear if AMR has clinically specific phenotypes. A consensus document for the selection of lung transplant candidates – 2014 — an update from the Pulmonary Transplantation Council of the International Society for Heart and Lung Transplantation. J Heart Lung Transplant 2015; 34: 1–15. Burkholderia cepacia, cystic fibrosis and outcomes following lung transplantation: experiences from a single center in Brazil. Clinics 2018; 73: 1–5. Lung transplantation for patients with cystic fibrosis and Burkholderia cepacia complex infection: a single-center experience. J Heart Lung Transplant 2010; 29: 1395–1404. Clinical outcome of cystic fibrosis patients colonized by Scedosporium species following lung transplantation: a single-center 15-year experience. Transpl Infect Dis 2017; 19: e12738–e12738. Development of the new lung allocation system in the United States. Am J Transplant 2006; 6: 1212–1227. Who is the high-risk recipient? Predicting mortality after lung transplantation using pretransplant risk factors. J Thorac Cardiovasc Surg 2009; 138: 1234–1238. Lung transplant in patients with scleroderma compared with pulmonary fibrosis. Short- and long-term outcomes. Ann Am Thorac Soc 2016; 13: 784–792. Survival and outcomes after lung transplantation for non-scleroderma connective tissue-related interstitial lung disease. J Heart Lung Transplant 2017; 36: 763–769. Lung transplantation for scleroderma lung disease: an international, multicenter, observational cohort study. J Heart Lung Transplant 2018; 37: 903–911.
. Effect of the lung allocation score on lung transplantation in the United States. J Heart Lung Transplant 2016; 35: 433–439. de Perrot M, et al. A review of lung transplant donor acceptability criteria. J Heart Lung Transplant 2003; 22: 1183–1200. Lung transplantation with lungs from older donors: an analysis of survival in elderly recipients. J Surg Res 2017; 214: 109–116. The number of lung transplants can be safely doubled using extended criteria donors; a single-center review. Transpl Int 2010; 23: 628–635. Donor infection and transmission to the recipient of a solid allograft. Am J Transplant 2008; 8: 2420–2425. Donor-to-host transmission of bacterial and fungal infections in lung transplantation. Am J Transplant 2006; 6: 178–182. Outcomes after transplantation of lungs preserved for more than 12 h: a retrospective study. Lancet Respir 2017; 5: 119–124. Normothermic ex vivo lung perfusion in clinical lung transplantation. N Engl J Med 2011; 364: 1431–1440. Continued successful evolution of extended criteria donor lungs for transplantation. Ann Thorac Surg 2017; 104: 1702–1709. Standard donor lung procurement with normothermic ex vivo lung perfusion: a prospective randomized clinical trial. J Heart Lung Transplant 2017; 36: 744–753. Size matching in lung transplantation. An evidence-based review. J Heart Lung Transplant 2013; 32: 849–860. Matching donor to recipient in lung transplantation: how much does size matter? J Thorac Cardiovasc Surg 2009; 137: 1234–1240. Donor–recipient size matching and survival after lung transplantation. A cohort study. Ann Am Thorac Soc 2013; 10: 418–425. Single- vs double-lung transplantation in patients with chronic obstructive pulmonary disease and idiopathic pulmonary fibrosis since the implementation of lung allocation based on medical need. JAMA 2015; 313: 936–914. Post-transplant survival in idiopathic pulmonary fibrosis patients concurrently listed for single and double lung transplantation. J Heart Lung Transplant 2016; 35: 657–660.
. The societal impact of single versus bilateral lung transplantation for chronic obstructive pulmonary disease. Am J Respir Crit Care Med 2011; 184: 1282–1288. The road to HLA antibody evaluation: do not rely on MFI. Am J Transplant 2017; 17: 1455–1461. Identification of risk epitope mismatches associated with de novo donor-specific HLA antibody development in cardiothoracic transplantation. Am J Transplant 2018; 369: 1215–1210. Clinical significance of pretransplant donor-specific antibodies in the setting of negative cell-based flow cytometry crossmatching in kidney transplant recipients. Am J Transplant 2016; 16: 3458–3467. De novo DQ donor-specific antibodies are associated with chronic lung allograft dysfunction after lung transplantation. Am J Respir Crit Care Med 2016; 194: 596–606. The impact of induction on survival after lung transplantation: an analysis of the International Society for Heart and Lung Transplantation Registry. Clin Transplant 2008; 22: 603–608. A randomized, double-blind, placebo-controlled, multicenter study of rabbit ATG in the prophylaxis of acute rejection in lung transplantation. Am J Transplant 2014; 14: 1191–1198. Three-year results of an investigator-driven multicenter, international, randomized open-label de novo trial to prevent BOS after lung transplantation. J Heart Lung Transplant 2015; 34: 16–25. Everolimus versus azathioprine in maintenance lung transplant recipients: an international, randomized, double-blind clinical trial. Am J Transplant 2006; 6: 169–177. Everolimus versus mycophenolate mofetil de novo after lung transplantation: a prospective, randomized, open-label trial. Am J Transplant 2016; 16: 3171–3180. Anti-human leukocyte antigen antibodies and preemptive antibody-directed therapy after lung transplantation. J Heart Lung Transplant 2010; 29: 973–980. A strategy for prevention of fungal infections in lung transplantation. Role of bronchoalveolar lavage fluid galactomannan and fungal culture. J Heart Lung Transplant 2018; 37: 886–894. Monitoring of early humoral immunity to identify lung recipients at risk for development of serious infections: a multicenter prospective study. J Heart Lung Transplant 2018; 37: 1001–1012. Bronchiolitis obliterans syndrome, hypogammaglobulinemia, and infectious complications of lung transplantation. J Heart Lung Transplant 2013; 32: 36–43. The Registry of the International Society for Heart and Lung Transplantation: Thirty-fourth Adult Lung and Heart-Lung Transplantation Report – 2017; Focus theme: Allograft ischemic time. J Heart Lung Transplant 2017; 36: 1047–1059. A new classification system for chronic lung allograft dysfunction. J Heart Lung Transplant 2014; 33: 127–133. A randomised controlled trial of azithromycin to prevent chronic rejection after lung transplantation. Eur Respir J 2011; 37: 164–172.
. Extracorporeal photopheresis for bronchiolitis obliterans syndrome after lung transplantation. Transplantation 2018; 102: 1059–1065. single-center experience. Transplantation 2008; 86: 1625–1627.
. Extracorporeal photopheresis for the management of lung allograft rejection. Clin Transplant 2017; 31: e13084. A prospective interventional study on the use of extracorporeal photopheresis in patients with bronchiolitis obliterans syndrome after lung transplantation. J Heart Lung Transplant 2012; 31: 950–957. De Wall C, et al. Phenotyping established chronic lung allograft dysfunction predicts extracorporeal photopheresis response in lung transplant patients. Am J Transplant 2013; 13: 911–918. The safety and efficacy of total lymphoid irradiation in progressive bronchiolitis obliterans syndrome after lung transplantation. Am J Transplant 2005; 5: 537–543. De novo donor-specific HLA antibodies are associated with early and high-grade bronchiolitis obliterans syndrome and death after lung transplantation. J Heart Lung Transplant 2014; 33: 1288–1294. Antibody-mediated rejection of the lung: a consensus report of the International Society for Heart and Lung Transplantation. J Heart Lung Transplant 2016; 35: 397–406. Acute and chronic onset of bronchiolitis obliterans syndrome (BOS): are they different entities? J Heart Lung Transplant 2002; 21: 658–666. Aged polymorphonuclear leukocytes cause fibrotic interstitial lung disease in the absence of regulation by B cells. Nat Immunol 2018; 19: 192–201. Two novel, severe asthma phenotypes identified during childhood using a clustering approach. Eur Respir J 2012; 40: 55–60.